(December 15, 2017) — Eleven Major League Soccer (MLS) clubs will play 11 matches in Phoenix and Tucson, the most matches ever played during the MLS Preseason event in Arizona. FC Tucson, in partnership with Phoenix Rising FC, released the full 2018 Mobile Mini Sun Cup schedule today. 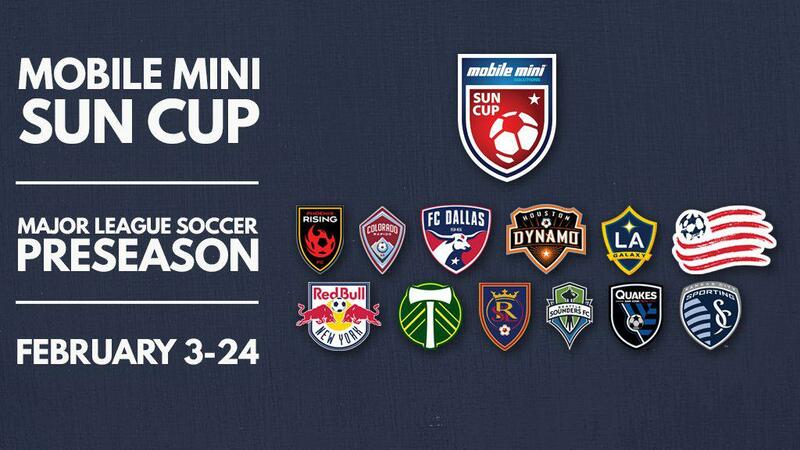 The opening day of the Mobile Mini Sun Cup will take place on Saturday February 3rd in Tucson at Kino Sports Complex, and feature one of MLS’s fiercest rivalries: Portland Timbers vs. Seattle Sounders. Phoenix Rising FC will square off against three MLS clubs at the Phoenix Rising Soccer Complex. On February 10, Phoenix Rising FC will play against an MLS club to be announced, on February 14th against the Colorado Rapids, and on February 17th against Sporting Kansas City. Tickets for all Mobile Mini Sun Cup matches are now available at PHXRisingFC.com or at FCTucson.com. Each day of the Mobile Mini Sun Cup only requires one ticket for access to all games during that day. Mobile Mini Sun cup games are included with all Phoenix Rising and FC Tucson season ticket memberships. Saturday, February 10, 2018 Phoenix Rising FC vs.